Twitter serves as an amazing water cooler in today’s social media era, and thanks to Twitter, I met Jake Poore due to two things we share in common: work experience with Disney and a passion for excellent customer service. We recently discussed why the brands that provide positive customer experiences will surpass their competition, and highlights follow below Jake’s brief bio. Meet Jake Poore. 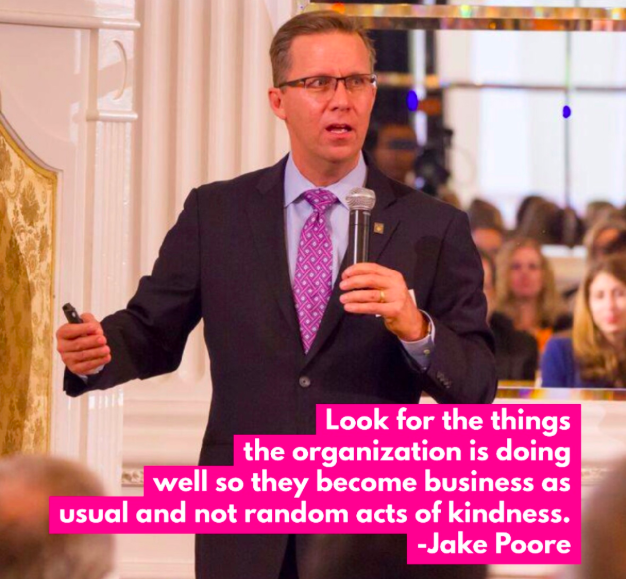 As President and Chief Experience Officer of Integrated Loyalty Systems in Orlando, Florida, Jake’s on a mission to elevate the human side of healthcare. For more than two decades, he has worked with healthcare leaders sharing the blueprints needed to create a culture that delivers exceptional patient and customer experiences. For 18 years, Jake worked for the Walt Disney World Company, where he helped launch the Disney Institute. Nearly 80 percent of the people who attended the Institute were from healthcare, and that’s where his passion for improving healthcare began. He is the author of the forthcoming book, “99 Lessons Learned from Disney to Improve the Patient Experience.” You can follow Jake on Twitter @JakePoore and read more about him on his website at www.wecreateloyalty.com. Q: You’ve written on your blog that, “Creating great experiences doesn’t require lots of money or huge effort. Instead, focus on the little things, the little wows, the little ways you can exceed your customers’ or patients’ expectations. When you add them all up, these little moments that delight your customers and patients are what define a world-class experience.” Can you provide some examples? JAKE POORE: I think that before we can delight, we must first remove the emotional hot spots in healthcare. Hospitals are notorious for creating lots of self-inflicted wounds in the patient experience, daily! Florence Nightingale, the mother of modern-day nursing said it best, “Apprehension, uncertainty, waiting, expectation, fear of surprise, do a patient more harm than any exertion.” In every patient or customer interaction, we are either elevating their fear and anxiety or unintentionally adding to it.